NISHINOMIYA, HYOGO PREF. 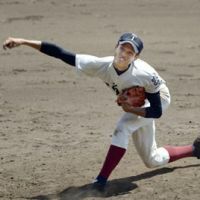 - Shintaro Fujinami threw his second straight shutout Thursday, leading Osaka Toin High School to a 3-0 victory over Aomori’s Kosei Gakuin to claim the title in the National High School Baseball Championship. The Osaka powerhouse, which also won the spring invitational championship in a showdown with Kosei in April, became the seventh school to win both of Japan’s most prestigious high school titles in the same year. 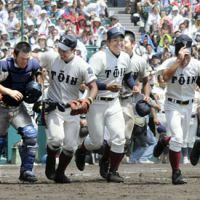 Tochigi’s Sakushin Gakuin, Aichi’s Chukyo Shogyo (currently Chukyodai Chukyo), Minoshima of Wakayama, Osaka’s PL Gakuen, Kanagawa’s Yokohama and Konan of Okinawa have also achieved the feat. Kenta Hakusui opened the scoring with a solo homer in the fourth inning at Koshien Stadium, and three infield hits and an error added two more runs in the fifth. Osaka Toin won its third summer national title — its first in four years — and fourth championship overall, including the spring invitational crown. 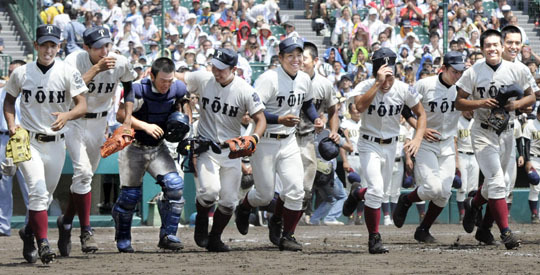 Kosei Gakuin finished runnerup in its third straight final after losing to Nichidai-san at the 2011 summer meet and falling 7-3 to Osaka Toin in this year’s spring invitational final. In the first-ever matchup between spring invitational finalists, Fujinami allowed just two hits and two walks over the distance in a 14-strikeout effort. The ace right-hander got two strikeouts each against Tatsuhiro Tamura and cleanup hitter Fumiya Hojo. It was Fujinami’s second shutout win following a 4-0 victory over Kochi’s Meitoku Gijuku in the semifinal on Wednesday. 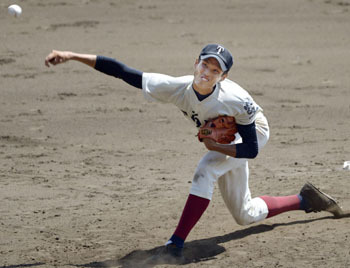 Kosei failed in its bid to become the first school from the Tohoku region to win the summer title. Osaka Toin’s title victory was the 11th for an Osaka school in the 94th edition of the tournament and 20th overall, including spring and summer titles.